Pic by Gemma Wiseman ~ I so love reflections in puddles after a downpour of rain! Pic by Gemma Wiseman ~ In the beautiful little Art and Craft Village at Tyabb is a railway carriage. Old steam railway carriages in Australia were known as "Red Rattlers". Hence the name of this carriage converted into a delightful little light snack kiosk. You may enjoy a little time outside on the verandah or experience one of the tiny inside rooms, still with the old travelling atmosphere. 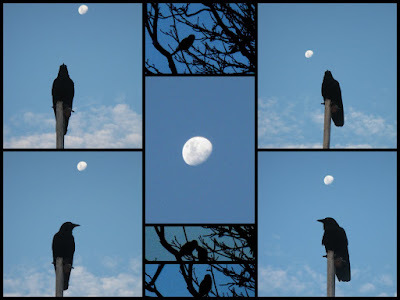 Pics/Collage by Gemma Wiseman ~ Crows on a flagpole and other birds in silhouette at my home in the Dromana Hills, Mornington Peninsula. The photos were taken late on a winter's afternoon. Pic by Gemma Wiseman ~ A flower growing in a pot on my verandah. Another plant is there, and suddenly as Winter began, this one appeared. In fact two of them appeared. They are a little like wild spirits loving the romance of life. Award from Bonnie Bonsai of Sydney, Australia! Blogoversary 2009 ~ 2 Years!! !